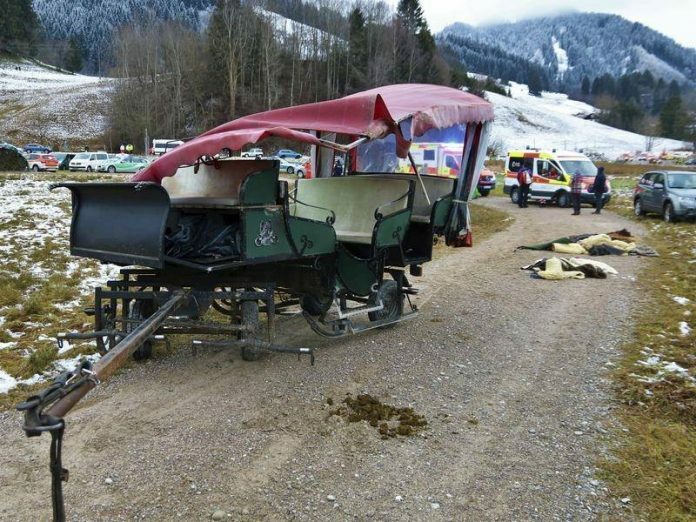 Twenty people have been injured, two seriously, after two horse-drawn carriages collided during a Christmas Day outing. Police in southern Bavaria said the two carriages, each carrying 10 passengers, were approaching a rail crossing single file when the first carriage halted. The second did not and overturned in the resulting collision. The 18 other people injured included children. They all suffered less serious or minor injuries and were tended to by 35 medical personnel. Police in the community of Pfronten are investigating and may place charges of suspicion of negligence causing bodily injury.